older souvenir shakers are made of plastic and are silver color with the Iowa state seal on the fronts. 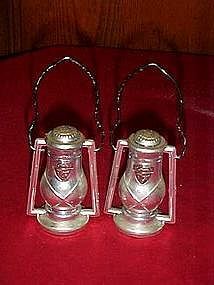 Measures 3" tall plus the lantern's bail handles. Sticker on the bottom say they were from Deupree Variety, Woodbine Iowa. Not excellent but are in good condition. There is some minor wear and scratches on the silver coloring but no big flakes. black paint on the bails are worn too.